Following the surrender of most major German units, some continued to fight the Allies in Europe for months. It was said on May 8, 1945, that some of the victors wandered around in a daze. They were puzzled by a strange silence. The guns were no longer firing the permanent barrage, their constant companion, during those last months since they had crossed the Rhine. Some could not quite believe it was all over. They had longed for an end to the war in Europe for years. “Then suddenly it was upon them all and the impact of the fact was a thing that failed to register–like the death of a loved one,” the historian of the U.S. 3rd Infantry Division wrote that year. Most of the GIs were not given, however, to philosophizing. They simply got blind drunk instead. It was Tuesday May 8, 1945—Victory in Europe Day. It was all over. The Germans were beaten at last. There was peace again. Were the Germans really beaten? Was there really peace in Europe? Over the past few weeks, the great Allied armies had swept through Hitler’s vaunted “1,000 Year-Reich,” which had lasted 12 years and five months, occupying everything from great, if shattered, cities to remote intact villages and hamlets. But in their urgent drive to kill the Nazi beast, they had left great swaths of territory in German hands. There were German outposts everywhere over hundreds of miles in Germany itself and in the former German-occupied countries, which seemed to come under no one’s control save that of the local commanders. In the area of Dessau, where the U.S. and Soviet Armies had failed to link up, the entire German infrastructure still functioned. For nearly two months, the locals ran their own post offices, telephone exchanges, and so on, guarded by a sizeable force of German soldiers, with the Allies totally unaware of the situation. Farther north in the area of the German border, SS troops still held out in the forests around Bad Segeberg. Well dug in, they refused to surrender until the commander of the British 11th Armored Division grew sick of the situation. He was not going to risk any more deaths in his division, which had suffered casualties enough since Normandy. 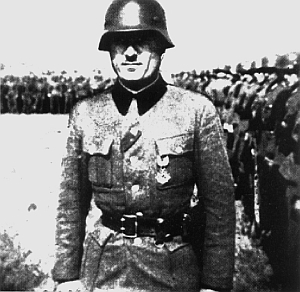 Instead, he ordered the commander of the German 8th Parachute Division to do the job for him. Thus, during the week after the war was officially over, German fought German to the death. These were not the only ones. On the Dutch island of Texel, across from the important German naval base of Den Heldern, a full-scale mini war had been under way since the end of April 1945. At that time, the 82nd Infantry Battalion, made up of Russian former prisoners of war from Soviet Georgia under some 400 German officers and noncommissioned officers, had been preparing to fight the Canadians who were advancing into Holland. The ex-POWs believed resistance would mean their death in combat or forced repatriation to Russia where again they might well be put to death as traitors. Instead of fighting for the Germans, they had mutinied under a broad-shouldered former pilot, Lieutenant Sjalwas Loladze. He argued that if they could take their German superiors by surprise and equip themselves with whatever artillery they could find on the island, they would be able to hold out until Canadian paratroopers dropped on Texel and relieved them. Thus it was that they carried out their own “night of the long knives” in late April. In one night they slaughtered their German officers and NCOs in their beds, some 250 of them, and took the rest of them prisoner. The battalion commander, a Major Breitner, could not be found in his quarters. That was not surprising. He was in bed with his mistress, a local Dutch girl. Hearing the midnight bursts of firing, Breitner thought the Canadians had landed, but he soon discovered that German weapons were being fired and that his troops had mutinied. At gunpoint, he forced a local fisherman to row him over to Den Heldern and alarmed the authorities there. The next day, the Battle of Texel commenced. The Germans advanced three battalions, some 3,500 men in all, and they soon forced the Georgians to retreat. Still, the former prisoners refused to surrender. Down to 400 men by May, they continued the bitter struggle in which no quarter was given or expected. When a Georgian was taken prisoner by the Germans, he was stripped of his uniform and shot on the spot. The ex-POWs had an even simpler method. They tied bundles of their prisoners together and attached a single grenade to them. It was bloody, but efficient, they thought. Besides, it saved their dwindling supply of ammunition. While the Canadians, who now occupied that part of Holland, looked on impotently (or so they said later), the men of the Georgian Battalion and their onetime German masters slaughtered each other ruthlessly. VE Day came and went, and they were still at it. On May 8, another cut off German garrison— that of the great German U-boat base at Lorient on the French coast—was still holding out, ignoring both the Allied order to surrender and that of the last Nazi leader, Admiral Karl Dönitz, to lay down their arms. Back in August 1944, Patton had intended to capture the key naval base, but after his army had suffered great losses at Brest and other Breton ports, he had called off the attack. Lorient was going to be allowed to wither on the vine. Unfortunately for the Allies, Lorient did not wither. For over a year, its commander, elderly General Wilhelm Fahrmbacher, had fought off attacks by the French and American troops who had surrounded the Lorient after Patton had departed with his Third Army. After winning the Knight’s Cross in Russia, Farmbacher had been put out to pasture at Lorient. 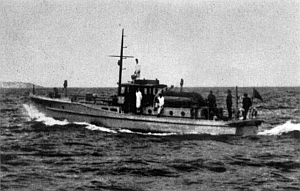 During what amounted to a siege, he had been supplied by U-boat and long-range aircraft, supplementing the garrison’s rations with raids on the French and Americans and penetrating their lines in depth to buy food from the local farmers, who were prepared to deal with the enemy—at a price. Throughout those long months, Farmbacher had succeeded in maintaining the garrison’s morale with a daily supply of that German staple—bread. Unknown to the troops, however, most of that freshly baked Komissbrot was made from sawdust. Fahrmbacher and his chief quartermaster, who kept the matter strictly secret, had had the local rail track pulled up to get at the wooden sleepers below. Daily and in secrecy, these sleepers were sawed up to make sawdust. Fahrmbacher knew the situation was hopeless. He could not feed the garrison with a couple of sacks of molding flour and the sawdust provided by one lone wooden sleeper. It was time to surrender. That afternoon, he sent his last message to Dönitz far away in North Germany at the small coastal town of Murwik. It read, “Wish to sign off with my steadfast and unbeaten men. We remember our sorely tried homeland. Long Live Germany.” Thereupon, he ordered one of his officers to make contact with the French besiegers in order to surrender. A little later, the elderly general found himself serving five years in a Parisian jail for having disfigured French property. His real crime was that he did not know the whereabouts of the French postage stamps that had been overprinted with the word “LORIENT” and used by the garrison. His French interrogator had wanted them for himself, knowing they were rare and would soon be valuable. They were, and they are. Today, each one of those 60-year-old stamps is worth at least $1,000. On the other side of the English Channel were the only possessions of Great Britain to have been occupied by the Germans in World War II. They were the Channel Islands, which the Germans had captured in June 1940. There, the Germans had fortified the three main islands and established a garrison of nearly 20,000 men. As 1944 gave way to 1945, these men, who were down to quarter rations, were calling themselves “Division Kanada” because they thought that was where they would end up as British POWs. They had not reckoned with their commander, the “Madman of the Channel Islands,” as they called 46-year-old Admiral Friedrich Huffmeier, formerly the commander of the German battlecruiser Scharnhorst. Huffmeier, tough, fanatical, and a convinced Nazi, did not care a bit about the wretched state of his starving men. He was determined not only to stick it out to the bitter end, but also to take the war to the enemy. 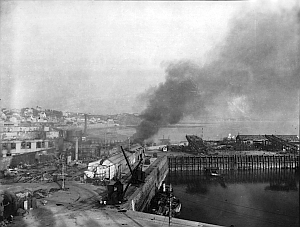 On the same day that the U.S. 9th Armored Division captured the famous bridge across the Rhine at Remagen, a group of Huffmeier’s men raided the little French port of Granville, which only six months before had been Eisenhower’s first headquarters in continental Europe. There, they caught the French garrison and the U.S. supply companies completely by surprise. They took some 90 GIs prisoner, looted the port, captured two small freighters, and returned to the Channel Islands as heroes. Huffmeier offered them the choice of a reward. Either they could have the Iron Cross or a spoonful of precious strawberry jam! They opted for the strawberry jam. It is not recorded if the Madman of the Channel Islands personally handed them their spoonful of jam for their heroic efforts. Now in May, with Germany clearly defeated, Huffmeier was already planning another attack on the Americans in France. However, another hard liner, Admiral Friedrich Frisius, who was the commander of the 12,000-strong garrison at Dunkirk farther up the French coast, had beaten him to it. Ever since the British Army had fled Europe in June 1940, Dunkirk had been a thorn in the flesh of the British and later the Americans. For years, the big German guns located at a spot some 20 miles from the white cliffs of Dover, had pounded southwestern England. From Dunkirk the Germans had received the first warning of the great Allied air armada soon to descend upon Holland in September 1944 during Operation Market Garden. In 1945, Frisius was not content to maintain a passive role, surrounded as Dunkirk now was by the exiled Czech Legion. Code-named Operation Bluecher after the great Prussian general of the Napoleonic Wars, Frisius launched a surprise attack on the Czech positions. The Germans advanced some 10 miles out of their fortified positions at Dunkirk. British engineers at Gravelines, south of Dunkirk, had to blow up the bridge on the River As to prevent them advancing any farther. The date was May 4, 1945, five days after Hitler had committed suicide! Then, he explained his plan. A group of volunteers would block the entrance to Granville harbor with a large freighter filled with cement. Next, the port would be looted, its installations destroyed completely, and the volunteers would escape in high-speed Luftwaffe motor launches. The date for the great attack, May 7, was one day after the German generals under the command of the Admiral Dönitz had surrendered to British Field Marshal Bernard Montgomery. That same day, Lieutenant Loladze, the commander of the Georgian rebels fighting for their lives in Holland, was trapped by the Germans. He entered a burned-out cottage, perhaps to look for food, when he heard a twig snap behind him. He swung around. Too late. His stomach was ripped apart by a burst of schmeisser fire at close range. His death seemed to symbolize the end of the German resistance in continental Europe. One day later, Admiral Huffmeier agreed through an intermediary to surrender. He was too frightened of his own rebellious troops, who had sworn to kill him, to venture out himself. Later, in brilliant sunshine, the British started landing their troops. After nearly five years of occupation, the only part of the British Isles captured by the Nazis was free at last. Still, some diehard Nazis, who believed they could continue the fight against the Western Allies despite Germany’s official surrender, continued to resist. Often, they were located in such remote places that the Allies were hardly aware of their presence. All the same, these small bands of tough Germans had played a key role in the secret war that Germany had waged against the West for months, even years. Daring the winter of 1940-1941 that Britain, and later Russia, had become aware of the presence of some strange Germans newly located in the Arctic wastes. In all, there were 16 teams of radio and weather specialists who transmitted their findings to Berlin so that the German high command could plan its operations against the Russians, the British Arctic convoys and, in the end, the last great counterattack against the Americans in the Ardennes. For four years, at varying times, Russians, Danes, Norwegians, Britons, Canadians, and finally Americans had sought these secret Germans. It had been a cat-and-mouse game, a small group of highly skilled and tough men on both sides hunting each other through the snow and ice over thousands of miles above the Arctic Circle. Every time the U.S. Coast Guard and the Danish sledge patrols were successful and thought they had finally eradicated the Germans, another radio station would commence broadcasting and they knew they would have to start all over again. Landed by U-boat, Dege and his team began to broadcast the raw weather data on which Hitler based his campaign in the Battle of the Bulge. From mid-October 1944 onward, when they bid farewell to the sun until the following March, they would provide vital weather forecasts that would encourage Hitler to believe he need not worry about Allied aerial attacks in the coming months of December and January at the turn of the year 1945. The Germans called the conditions “Führer Weather,” ideal for the campaign to come—rain and fog and probably heavy snow for the last two weeks of December 1944. On the basis of this information, Hitler ordered the great surprise attack, which would commence on December 16. On the whole, these “secret Germans” were correct in their estimates. The Battle of the Bulge commenced in that foul weather. As every student of that great battle knows, the conditions changed dramatically on December 22, and Germany’s last bold attempt to change the course of the war ended in defeat. The German weather experts continued to send their forecasts back to the Reich to the bitter end. They were still at it when, on May 22, 1945, Admiral Dönitz and members of his government were arrested by the British and there was no longer anyone to report to. We do not know the mood of Dr. Dege and his team at that time. Perhaps they decided to continue studying the weather in that remote waste in the interests of science, but their supplies were beginning to run out and it was clear that October would soon bring a long winter with little food and no light. As hardy as they were, Dr. Dege and his men could not stand that. He decided to surrender. He was resolutely assured that Adolf Hitler was indeed no longer in the land of the living. Well-known author Charles Whiting has written numerous books on topics related to World War II. He resides in England. Tags Battle of Texel, Battle of the Bulge, Channel Islands, Dunkirk, England, France, Friedrich Frisius, Friedrich Huffmeier, Germany, Great Britain, Lorient, Operation Bluecher, U.S. Third Army, Wilhelm Fahrmbacher.